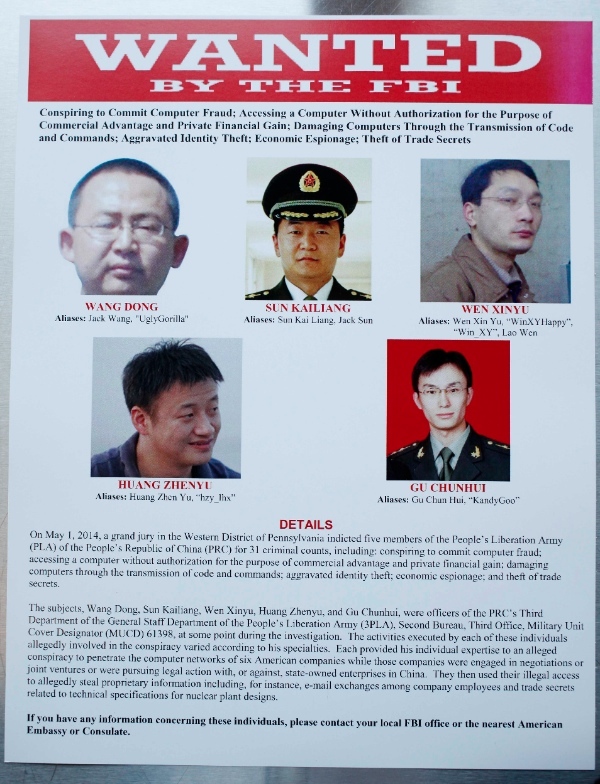 Lashing out at the United States after a US grand jury indicted five Chinese military officers of hacking into American companies to steal trade secrets, Beijing said it has suspended all activities of the China-US Cyber Working Group. “Given the lack of sincerity on the part of the US to solve issues related to cyber security through dialogue and cooperation, China has decided to suspend activities of the China-US Cyber Working Group,” said Foreign Ministry spokesman Qin Gang regarding the U.S. Justice Department’s announcement on Monday, in what could further stoke tensions between the world’s top two economic powers. Alcoa, Westinghouse, Allegheny Technologies, US Steel, the United Steelworkers Union and SolarWorld are the five companies whose data were allegedly hacked into by the five Chinese officers. “The US move, which is based on intentionally-fabricated facts, grossly violates the basic norms governing international relations and jeopardizes China-US cooperation and mutual trust,” Qin said. Beijing summoned US Ambassador Max Baucus to lodge a strong protest after the announcement. The US accusation against Chinese personnel is “purely ungrounded and with ulterior purpose,” said Qin, adding a warning that China would react further to the US “indictment” as the situation evolves. Qin also pointed out that there has been a global outcry over the US’ National Security Agency spying on the world’s population and eavesdropping on a number of foreign leaders, including Brazil’s President Dilma Rousseff and German Chancellor Angela Merkel. China on Monday reiterated its charges against the US of cyber theft, wiretapping and surveillance activities. According to documents leaked by Edward Snowden, the US NSA had hacked into Chinese telecom giant Huawei. According to a report by German daily Spiegel, not only did the US security agency manage to intercept emails, but it also gained access to the company’s source code of specific products. “If it is true, the irony is that exactly what they are doing to us is what they have always charged that the Chinese are doing through us,” Bill Plummer, Huawei spokesperson was earlier quoted by Spiegel. NSA spying revealed by the former employee Snowden showed that Washington has spied on at least 35 world leaders besides the exposed the mass surveillance against private citizens and business.